Home » Products » Imperial Russian Antiques » C1900 Imperial Russian Gold Cufflinks, Dirigible form, 14 ct.
14 ct gold Imperial period Russian Cufflinks. Formerly the property of an aristocrat. 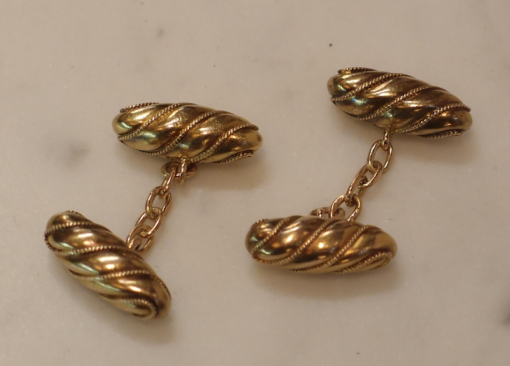 This fine pair of excellent condition cufflinks is in the shape of dirigibles with wrythen form, applied, twisted wire swirls. The cufflinks are 4 grams and each dirigible is 20 mm long. These are marked 56, the Russian hallmark for 14 carat gold, on the jump ring of each dirigible.There are additional marks, apparently 56 and the two maker's initial on the central chain link, but I cannot read them. 14 ct gold Imperial period Russian Cufflinks. Formerly the property of an aristocrat. This fine pair of excellent condition cufflinks is in the shape of dirigibles with wrythen form, applied, twisted wire swirls. The cufflinks are 4 grams and each dirigible is 20 mm long. These are marked 56, the Russian hallmark for 14 carat gold, on the jump ring of each dirigible.There are additional marks, apparently 56 and the two maker’s initial on the central chain link, but I cannot read them.